Air Jordan 2 Retro QF is out on the market again, but this time the shoes is looking to entice buyers with its solid colours. 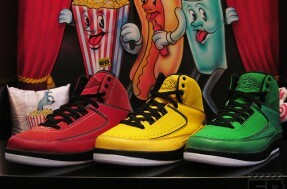 The “Candy Pack” as what they’ve called since it is available in classic green, del sol yellow, and varsity red. All three colours have the same white outsole and black midsole like original colorways of the shoes. Just like it’s original colorways, the shoe have the same comfortable feel and have a great value for its price. Although some are saying that the colours ruined the original version, this one will still definitely be a hit especially for Jordan Shoes collectors.